Another tackle by uh... Too-too? Im sure he's feeling the love already. I'm always for signing players in which Kessling will botch their names! Guys... we get it. He has a unique name. For the love of god stop with the amateur hour unoriginal comedy attempts. Kesling jokes never got old. Picturing him wide eyed trying to say this dudes name cracks me up. 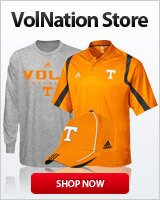 The average age of Volnation posters just dropped...to 10 year olds. And these guys wonder why people make fun of Vol fans. We should T'oo. OtOoh, maybe we should not. "Henry Tarantino on the tackle"
Come to Tennessee. Theres no place like home. Were not in Kansas anymore.